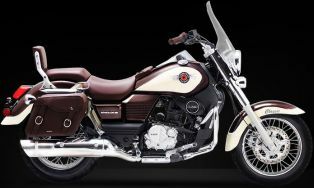 The UM Renegade Commando Classic is highly inspired by the styling of Harley Davidson motorcycles. The bike shares same underpinnings with its other stable mates with distinguishing classic style. The cruiser is featured with loads of chrome and classy two tone color scheme. Classic Saddlebags, alloy backrest and tall windshield justifies the cruiser tag of the Renegade Commando Classic.